Friday the 13th turned out to be a lucky day for Elizabeth “Beezie” Madden of the United States, as she took first place for the second day in a row at the Longines FEI World Cup™ Jumping Finals in Paris. Madden, who won the speed class on Thursday, outrode nine competitors in a tight Table A jump off for the top spot on Day 2 of the three-day event. Once again giving the audience and her opponents a textbook ride to learn by, Madden managed her horse Breitling LS beautifully in both the first round and the final jump off, in which she finished in a mere 33.22 seconds. No stranger to the pressure of a World Cup event, Madden won the championship in 2013 and is poised to take another title when competition resumes on Sunday for the Grand Prix. Finishing in just fractions of a second behind Madden were Harrie Smolders of the Netherlands, who completed the jump off in 33.44 seconds for second place, and Sweden’s Henrik Von Eckermann, who took third with a jump off time of 33.92 seconds. Von Eckerman and Madden are separated by just one fence going into the Grand Prix as points accumulated during the first two days of the finals are converted to penalty points for Day 3. Having won the first two days’ competition, Madden starts Sunday’s event, sure to be a nailbiter, with zero penalties, while Von Eckermann begins with four. The challenging course designed by Santiago Valero Ullastres of Spain for the first round contained 14 obstacles and 17 efforts. Whilst the jumps themselves posed problems for some of the riders, time was more of a factor for many. Six riders failed to make it into the jump off, despite clear rounds, because they accrued one heartbreaking penalty point for failing to finish in under 75 seconds. Those who made it to the jump off were faced with a six-obstacle course that required long gallops along the side, including one to the finish, as well as a tough decision whether or not to turn inside or outside heading into the oxer that made up the third jump. In addition to Madden, Smolders, and Von Eckermann, six other riders braved the second course with mixed results. Olivier Philippaerts of Belgium turned in a clear ride in 35.19 seconds for fourth place, which is also his ranking going into Sunday’s Grand Prix. Kevin Staut, a home favourite from France, also rode clear in the jump off, at 36.87 seconds for fifth place on Day 2. However a disappointing ride on Thursday that resulted in a change of horse for the following day means he’ll start further down the field on Sunday. Could Sunday bring a surprise? American Jamie Barge rode clear in the jump off as well (27.02 seconds). Douglas Lindelöw of Sweden and defending champion Mclain Ward of the USA weren’t so fortunate. Both risked tight lines in the jump off that brought down the top rail of a double, and they each finished with four penalty points for the day, tying them with Philippaerts heading into Sunday’s competition and meaning they’ll start with eight penalty points. The French audience was elated to see another rider representing France in the jump off. But like Ward and Lindelöw, Simon Delestre couldn’t see his way to ride clear. He knocked down a bar on the final obstacle and had to settle for ninth place and a time of 35.57 seconds and four penalty points. 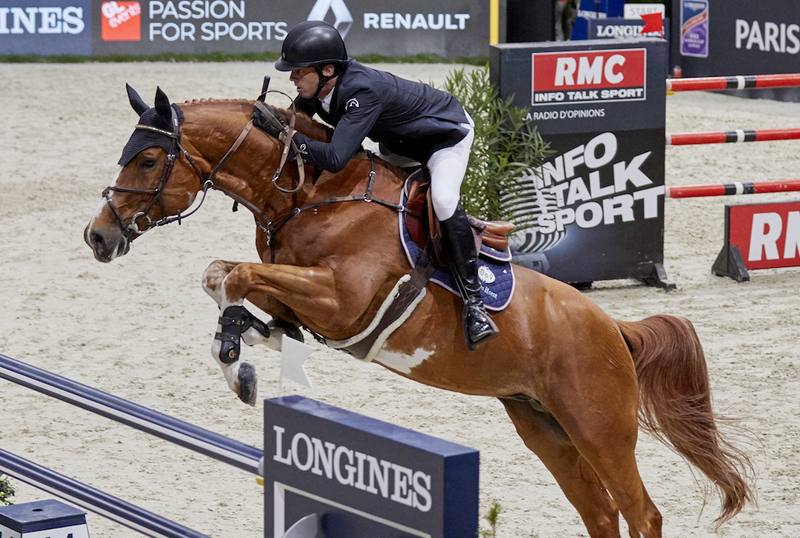 Whilst the podium may look close for the top riders after Day 2 of Jumping, the Grand Prix will undoubtedly test both the riders’ mettle and their horses’ endurance. Will there be a surprise victory on Sunday at the Accor Hotels Arena? Stay tuned to FEI TV to see if Beezie Madden will prevail or if your favourite riding combo will shoot to victory in the Grand Prix. With so much talent competing in such close contention, anything can happen!